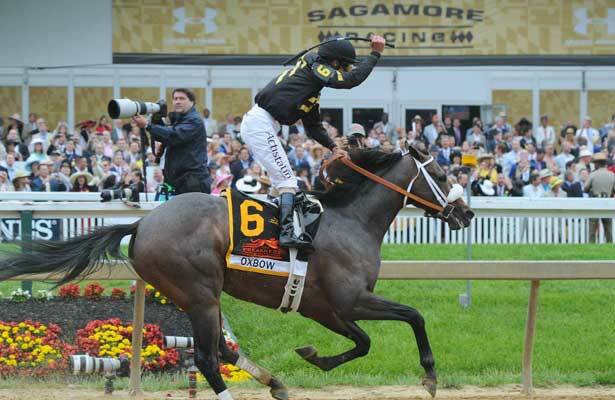 Congratulations to Preakness 2013 hero Oxbow. Nobody wanted the early lead and Gary Stevens was more than happy to canter around the track and win this second jewel of the Triple Crown. Oxbow, owned by Calumet Farm, is a war horse for throwback connections Wayne Lukas and Gary Stevens. The Preakness Stakes was his 11th lifetime start and there is no rest in sight with the Test of Champions squarely on his radar screen. Did Lukas scare everyone from a pace perspective? He entered sprinter Titletown Five and possibly fooled jockey Kevin Krigger aboard Goldencents. Titletown Five did not go for the lead under Leaproux, and Goldencents failed to take advantage so Stevens and Oxbow walked the dog from start to finish. I knew that Oxbow was best on the lead but did not think he was quick enough to get there. The pace figured to be slower than the Derby but I did not see the crawling Preakness pace coming. Runner-up Itsmyluckyday was making his 12th career start in Baltimore so chalk another one up for experience. He got the best of the draw as an outside stalker and rediscovered his sharp Florida form. Mylute picked up another minor check in stakes race. He was the only one making up any ground and the Preakness was his fifth place/show finish in the stakes ranks. Kentucky Derby winner Orb seemed to be living a charmed life until he drew the dead rail. The outside closer never looked comfortable and went through the motions in a flat 4th place finish. Granted, before the Preakness, Orb handled wet/fast footing and various pace scenarios but the Derby fell into the lap of a closer and everything went perfectly for Shug and company on the first Saturday in May. Goldencents had one shot and that was to attempt a wire job but was ridden passively. He is a quality early runner with distance limitations and his best weapon was taken away at Pimlico. Departing sat right outside of Orb and made a top three bid along the inside turning for home. He flattened out to finish 6th and was not disgraced in his toughest test to date. Will Take Charge, Govenor Charlie, and Titletown Five trailed. It is on the Belmont Stakes in 20-days and my top ranked sophomore Revolutionary looms large in the Test of Champions. Code West (Lemon Drop Kid) – Baffert’s runner followed up a place finish in the Risen Star with a 6th in the LA Derby. He finished 2nd on the Derby undercard and beat older allowance rivals to cap the Preakness Day card. Freedom Child (Malibu Moon): Freaked in the muddy Peter Pan Stakes and looms a pace factor at the very least in the Test of Champions. Split Orb and Revolutionary in a maiden race at the Big A last November. Golden Soul (Perfect Soul) – LA Derby 4th place finisher took advantage of a pace meltdown to land the place in the Kentucky Derby. Dallas Stewart’s late runner is scheduled to work at Churchill next Wed. or Thurs. Itsmyluckyday (Lawyer Ron) – Florida Derby runner-up flopped in the Derby and rebounded with a place finish in the Preakness. The Monmouth Park based colt is targeting the Haskell this summer but is still possible for the Belmont Stakes. Micromanage (Medaglia d’Oro) – Finished 10th in the G2 Remsen to end his juvenile campaign. Returned with a game neck victory (wide trip) vs. allowance rivals at Monmouth May 11 and could go next in the Belmont Stakes. Orb (Malibu Moon) – Everything went right in the Kentucky Derby but the wheels came off the cart in the Preakness, ending his 5-race winning streak. He may try to rebound in the Belmont Stakes but there is talk of resting him and waiting for Saratoga. Overanalyze (Dixie Union) – G2 Remsen hero finished a wide, flat 5th from post 11 in his needed Gotham return. He bounced back nicely to win the Arkansas Derby and ended up 11th in the Kentucky Derby. Breezed 4f in :47.50 (3/34) at Belmont Park (dirt training) on 5-19. Oxbow (Awesome Again) – Finished a solid 6th in the Derby after attending fast fractions from an inner post under Gary Stevens. Lukas trainee snuck away early and stole the Preakness for Stevens. He shows up for every dance so expect him to complete in the final leg of the Triple Crown series. Palace Malice (Curlin): Risen Star show finisher ended up a troubled 7th in the LA Derby and rebounded with a 2nd in the Blue Grass. He set fast splits (blinkers on) before fading to 12th in the Kentucky Derby and is now targeting the Belmont. He breezed 4f in :47.49 (2/34) at Belmont Park (dirt training) on 5-19. Power Broker (Pulpit) – $360k purchase graduated in style vs. graded foes in FrontRunner and raced wide and never got a chance to run his race in BC Juvenile. Baffert trainee finished 5th in his SA Derby return and won an allowance race at Churchill on May 10. The Belmont Stakes is a possibility. Revolutionary (War Pass) – He has been my top ranked 3yo since February and my confidence has not wavered following a solid show finish in the Derby. I thought the Belmont Stakes was perfect for him after his smart Withers score earlier this year and he is bred to run all day on the dam side. He will work twice for the Belmont beginning Sunday, May 26. Unlimited Budget (Street Sense) – 3-time graded winner lost for the first time after landing the show in the Kentucky Oaks. The Pletcher/Repole filly breezed 4f in :49.07 (14/34) at Belmont Park (dirt training) on 5-19. Thanks to everyone for purchasing my Preakness Day analysis from Pimlico on Saturday, May 18. For those who missed it, I have included highlights and analysis below. Weather: AM Clouds/PM Sun. High 75. Thanks to everyone for purchasing my Black-Eyed Susan Day analysis from Pimlico on Friday, May 17. For those who missed it, I have included highlights and analysis below. My 2013 Preakness Day full card is complete and ready to purchase. Check out my Saturday (May 18) Preakness Day full card analysis from Pimlico (available now) and Bonus Free Pick (PIM 13th race, click view sample) at TodaysRacingDigest.com. Pimlico (Sat. May 18 – Preakness Day) – available now! Preakness 2013 Preview: Will Orb overcome inside post? 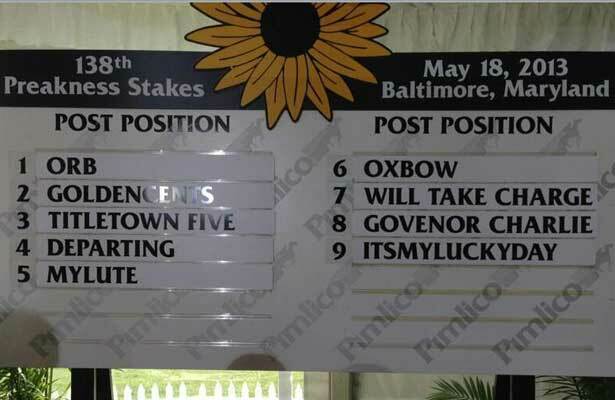 The field has been set for Preakness 2013 and even money favorite Orb will break from the rail. 1. Orb (Malibu Moon) – Tabasco Cat is the only horse in the last 41 years to win the Preakness Stakes from post one and Orb likes to make wide, sweeping moves. If he is a legit Triple Crown threat the inside post will not bother him and Rosario continues to ride great. I have always liked Shug’s colt but he won’t offer any value in Baltimore. 2. Goldencents (Into Mischief) – SA Derby winner hated the Derby wet track and the pace scenario did not help his cause. He is a quality speed horse but needs everything to go his way to compete vs. these at this distance. Krigger might send him and play catch me if you can. 3. Titletown Five (Tiznow) – He finished in front of Orb in a Saratoga maiden race last summer. He has raw talent but is best as a sprinter at this stage. Interesting that patient rider Leparoux takes over. They are trying to get him to relax. 4. Departing (War Front) – Playing the part of Red Bullet is Departing and taking over the role of Fusaichi Pegasus is Orb. At least that is what trainer Al Stall Jr. is hoping. He is 4-for-5 lifetime and the LA Derby was a productive prep. He did not beat much in the Illinois Derby but looked good doing it. 5. Mylute (Midnight Lute) – He is winless in seven stakes outings but is usually in the hunt. Napravnik was the queen of Maryland racing when she rode at Laurel/Pimlico and she really wants to win the Preakness. 6. Oxbow (Awesome Again) – Lukas trainee was done in by the quick Derby splits but hung in there to finish a fine 6th. His main problem is that he pulled off wire jobs in both career wins but is not quick enough to grab the early lead in the Preakness. 7. Will Take Charge (Unbridled’s Song) – Smarty Jones/Rebel winner finished a troubled 8th in the Derby. He is a bit interesting if he finds clear sailing under Mike Smith but is not fast enough and has yet to win beyond a mile and a sixteenth. 8. Govenor Charlie (Midnight Lute) – G3 Sunland Derby hero is lightly raced and on the improve. He lacks seasoning and has recovered from the minor hind foot issue that forced him to miss the Derby. Look for him to make some noise later this year. 9. Itsmyluckyday (Lawyer Ron) – Eddie Plesa’s colt got the best of the draw based on his preferred outside stalk and pounce style. The Florida Derby runner-up flopped in the Derby and may have peaked in January. Orb beat him in his last pair. Check out my Friday & Saturday (May 17-18) Black-Eyed Susan & Preakness Day full card analysis from Pimlico (available now) and Bonus Free Pick (PIM 8th race, click view sample) at TodaysRacingDigest.com. Pimlico (Fri. May 17 – Black-Eyed Susan Day) – available now! Preakness 2013 Contenders – Will Orb capture second jewel? Congratulations to Kentucky Derby 2013 hero Orb, and it was nice to see Shug McGaughey saddle his first Derby winner as well. He looks like a runaway locomotive at this point and might be too hot to handle in Preakness 2013. Orb was one of my Exciting Prospects when I posted my first Derby Top 10 list last September. He lacked maturity in his first three outings but has really put everything together since. The Derby was his fifth straight win and he goes to Baltimore on a serious roll. He received a great pace setup in the Derby and it could be more of the same in the Preakness with the likes of Titletown Five and Goldencents on the engine early. Speaking of rolls, jockey Joel Rosario has been unstoppable since winning the Dubai World Cup. Orb is currently preparing for the second jewel at Belmont Park and will ship to Pimlico early next week. It is fun to talk about Orb’s Triple Crown chances but let’s not get ahead of ourselves. History is not on his side but he does possess all of the tools to give it a serious run. The son of Malibu Moon wheels back quickly on May 18 and it should be noted that he graduated off two weeks rest last year. I also saw a stat on TVG earlier this week about Shug McGaughey clicking at a 50% rate (6-for-12) when he brings horses back in 14-days. New shooter Departing might be his biggest competition. Look out if Orb makes it past the Preakness but he will still have to beat fresh, talented rival Revolutionary at Big Sandy. That’s a discussion for another day. Derby runner-up Golden Soul is pointing to the Belmont Stakes. He finished 2nd in the Derby because of the pace and will be an underlay in the Test of Champions. My Derby selection Revolutionary, the top ranked contender on my Derby list since February, ran well to land the show on the first Saturday in May. I have not lost faith and he reminds me of my past Derby/Belmont picks Empire Maker and Union Rags. Oxbow was too close to the rapid Derby pace and Normandy Invasion moved too soon. Both are players in Baltimore, especially the latter if Chad Brown opts to go in that direction. Mylute took advantage of the fleet fractions and was in the show photo (finished 5th). If he runs in the Preakness, note that jockey Rosie Napravnik has plenty of Pimlico experience. Will Take Charge was making a move with Orb in the Derby but Verrazano was backing up and stopped his momentum. The Derby was his first start beyond a mile and a sixteenth and he was coming off a layoff so it was not a bad effort finishing 8th. Goldencents seemingly hated the Derby slop and will be part of the Preakness pace, especially if the track is fast. Click on the names of each horse below (Top 5 contenders) to view their Horse Racing Nation profile page, which includes pedigree information, results, and video. Orb (Malibu Moon) – Won his fifth straight race for Shug McGaughey in the G1 Kentucky Derby (wet track) and the strong finisher adapts to various pace scenarios. Red hot jockey Joel Rosario has been on a roll since the Dubai Gold Cup and he is an obvious major stretch player in Baltimore. Departing (War Front) – Finished 3rd in the productive Louisiana Derby and overcame a wide draw to smartly take down the Illinois Derby. The Al Stall Jr. runner is a dangerous new shooter and it is nice to see him join the Triple Crown series. Normandy Invasion (Tapit) – Chad Brown’s colt trained aggressively and moved too soon under Javier Castellano in the Derby. He needs to sit back with Orb and make a big late run in the Preakness. He is reportedly much more relaxed since returning to New York. His ultimate goal is the G1 Travers at the Spa in August. Mylute (Midnight Lute) – LA Derby runner-up rallied to finish 5th on the first Saturday in May under Rosie Napravnik. Trainer Tom Amoss said that his Preakness status would be revealed on Saturday morning. Oxbow (Awesome Again) – G3 Lecomte hero shows up for every dance and finished a solid 6th in the Derby after attending fast fractions from an inner post under Gary Stevens. Lukas trainee can rate but went all the way in both career wins. His main problem is that he is usually not quick enough to grab the early lead. Will Take Charge (Unbridled’s Song) – Smarty Jones/Rebel winner finished a respectable 8th in the Derby. He did find some traffic but that is to be expected in a 19-horse field. Mike Smith will ride in the Preakness and he could improve 2nd off the shelf. Itsmyluckyday (Lawyer Ron) – Eddie Plesa Jr.’s colt was the talk of Florida earlier this year at the Gulf. The Holy Bull hero played second fiddle to Orb in the Florida Derby and finished a disappointing 15th on the first Saturday in May. John Velazquez will ride in the Preakness. Goldencents (Into Mischief) – Doug O’Neill’s quality early-pressing type seemingly hated the Derby wet track and the pace scenario did not help either. He earned a strong number in the SA Derby and is capable of big efforts on fast ground under the proper race shape. Govenor Charlie (Midnight Lute) – Smartly captured G3 Sunland Derby in his third career start. The Baffert trainee has plenty of upside but still lacks seasoning. He wisely passed on the Derby and has seemingly recovered from a minor hind foot issue. Worked 6f in 1:11.80 (1/3) at Churchill Downs on 5-7. Street Spice (Street Sense) – Illinois Derby 5th place finisher seems up against it in the Preakness. He likely needs to find a softer spot to be competitive. Breezed 5f from the gate in 1:03.40 (27/33) at Arlington Park on 5-4. Titletown Five (Tiznow) – Has lost all three starts this year and looks like a sprinter at this point. He will attend the Preakness pace before fading. Breezed 4f in :47.60 (5/35) at Churchill Downs on 5-7. Vyjack (Into Mischief) – 18th place Derby finisher has now dropped two straight. He came out of the Wood Memorial with a lung infection and that hiccup probably cost him under the Twin Spires. He has talent but is not sharp right now. Thanks to everyone for purchasing my Kentucky Derby Day analysis from Churchill Downs last Saturday, May 4. For those who missed it, I have included highlights and analysis below. Check out my Saturday (May 11) Churchill Downs full card analysis (available now) and Bonus Free Pick (CD 11th race, click view sample) at TodaysRacingDigest.com. Churchill (Sat. May 11) – available now! Weather: Showers (50% chance). High 61. Best Bets (races 4, 9, 11, 12). The field is set for Kentucky Derby 2013 and it has been a crazy week at the offices of HorseRacingNation.com. On Tuesday, I traveled to Churchill Downs and interviewed trainer Michelle Lovell. She is based at Fair Grounds in the winter and Churchill Downs in the spring. I wanted to find out about the differences in the two tracks and I also asked her about Rosie Napravnik, Mylute, and the Fair Grounds Derby horses. Thursday was fun. I got to shoot three videos with special guests. Ryan Patterson had a great idea about a video consisting of a wet track scenario for the Derby. We did not have time to shoot it last week but jumped right into that one after checking the weather forecast for the first Saturday in May. I have not done a video with Mike Shutty for quite some time. It was good to see him again and our video theme was live Derby longshots. If you need help in the Derby, check out Mike’s Kentucky Derby Super Screener product. Finally, Jasen Mangrum contacted me last week and we set up a video for Thursday afternoon. I told him to pick a topic and he settled on the Kentucky Oaks-Woodford Reserve Turf Classic-Kentucky Derby Pick 3. Also, check out the Super Screener Handicapping Seminars. If you would like to hear our Derby Day thoughts, I will be at my regular weekend spot on The Fast Track with Steve Bortstein radio show on Saturday morning (weekends at 10am eastern time). Special thanks to my video editor and photographer, Stacy Edwards.